This is the third newsletter for the year and one of its main purposes is to remind all members of the Annual General Meeting to be held at the United Services Club on Friday 15 September 2006. Members are asked to advise QURA by return email to our Membership Registrar (Peter Morton ). This year at the AGM, George Fryberg has kindly accepted an invitation to offer us some words of wisdom. I am confident it will be enjoyable. Bruce Davis currently serving full time in the Office of the Office of Reserves in Canberra has also offered to present a quick update of things “Reserve” in Australia. Being the AGM there will be the election of office bearers for 2006/2007 year. Any member who wishes to offer his or her name to assist with the operational activities of the Association are welcome to put their name forward. I will be only too happy to ensure that the volunteer’s nomination is accepted. 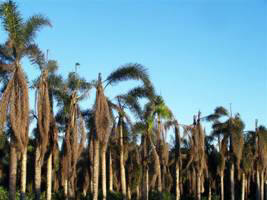 Members are urged to consider this way of assisting the Association. A copy of the nomination form is available on the QURA website (click here ). Work is currently underway on changing the management of the QURA website to one which is not so affected by changes in the Executive Committee. Currently Peter Morton has generously managed the website at his own personal cost. The changes will ensure that the website can be managed by any authorized member so it is not so reliant on just one member. I wish to extend the gratitude of all members to Peter for his generosity both in money and time. Work is still continuing on the collection and preservation of historical items. QURA has been advised that it is soon to receive some photos and historical items formerly belonging to Alex Freeleagus. We look forward to receiving them and will publish them onto the website as soon as they can be processed. I appeal to all members to make their photos and any articles available. I appeal to all to check their storage for anything relating to QUR so they can be published on the website. I am mostly interested in any copies of the old camp newsletter “CONTACT”. I am eager to get some old copies so they can be copied and displayed at the regiment in the new display cases. I remind all members that a significant part of the history of the regiment was lost in the floods so gaining access to personal historical items is extremely important. Members will recall an article in the last Newsletter about BJ Price's ordeal from Cyclone Larry. Under the rules of the QURA Constitution, which provides the Association with the power to financially support any member in exceptional hardship, the executive exercised this power on behalf of members and provided some financial assistance to BJ to help, in some small way, in overcoming his misfortune at the hands of Cyclone Larry. I look forward to meeting you all at the forthcoming AGM in Spetember. Again this has been a busy time for the unit. Over the past six weeks or so the staff have conducted 6 courses. It has felt a bit like a sausage factory with staff fronting up for day one of a course while other staff are packing up at the end of their two week stint. We have conducted an induction course, an Officer of Cadets introductory course and Officer's course, and modules IIB, IIIA1 and IIIA2 of First Appointment Course. block training period. We are farewelling CAPT John Skalij and WO2 Brendan McLean, two of our ARA cadre, who have both decided to leave the ARA and pursue civilian careers. Holding the fort has been CAPT Andy McCarthy who has taken on Full Time Service for the next year to give day to day support. We are all looking forward to the clear skies at the other end of this training block period where we will be able to settle back, consolidate and prepare for the next set of challenges. In the guard minute book a photocopy of a cheque exists addressed to LTCOL RI Harrison. Sam was sent $14.25 for meals and accomodation for attending a QUR TEWT. Had the Army paid what was asked for it would have cost around $2 for a traveling allowance. The guard book caption is “An example of Formation Bloody Mindedness”. Quote from a platoon Commander over the radio from an 1967 exercise “ Get off the net enemy, we haven’t eaten for two days and you’re stuffing the exercise”. Peter Morton – Suffocated when his pile of blankets fell on him. When the colours were trooped 29 May 1960 one of the colour sergeants was Phillip Bushell- Guthrie. Routine Order 24 March 1949 issued by 9 Battalion Commanding Officer (LTCOL Jack Amies OBE) who administered the command of QUR , took the following recruits to form QUR …. “Do all enemy wear black shirts? We have captured two with green. Have they been issued with them?” - From a transmitted signals message form A company. “Alpha Company is poaching on our area, Platoon sited at GR 037613”- An example of good wireless security from B company. During an enemy attack a certain corporal called out “Bang Bang ! You’re dead”. Enemy DS asked : “What’s the matter sonny, won't your gun work?” “No sir”, came the reply, “Its an OMC.” DS: “Bad luck sonny, maybe you’ll graduate to an SLR next year”. Why not provide some little snippets for publication in this section? Why not share some secrets? Remember no names no pack drill! As mentioned in the previous newsletter, some of our members are busy training and preparing to walk the Kokoda Track in the middle of this year. They have promised to write an article for us and to take many photos. We look forward eagerly to their contribution. This is a quick note to let you know that, at lunch on the second day, and after discussions with the trek leaders, I decided to drop out of the Kokoda trek. 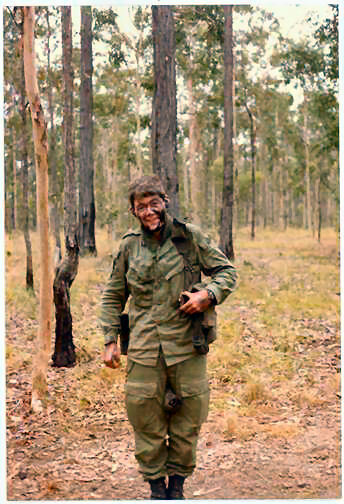 The conditions were much darker under the canopy than I could work with, and the mud made everything the same colour. I had a great deal of trouble seeing where I could safely put my feet, and I was probably lucky to get as far as I did doing myself a serious injury, or worse, injuring someone else. The porter who was looking after me certainly should have been in fear for his life. I made it as far as Isurava, and I was taken back to Port Moresby in a helicopter on Monday morning. I returned to Brisbane on the Tuesday. The rest of the group moved on to Eroa Creek and beyond, and I dare say they are making much quicker progress without me. Thanks to all of you for your good wishes prior to the trip, and I will try to get in touch with you individually in the near future. The Annual General Meeting for the QUR Association will be held at United Service Club, Wickham Terrace, Brisbane on the evening of Friday 15 September 2005 at 1900 for 1930 hours. The cost of the AGM will be $75.00 which includes pre-dinner drinks and a three course meal including wine and port. For those members with internet banking, a payment of $75.00 may be made direct to the QURA Bank Account. IF YOU WISH TO ADD A BIT OF NEW BLOOD TO OUR AGEING EXECUTIVE COMMITTEE, NOW IS YOUR CHANCE!! Part of the speech given by Sir Zelman Cowan at the Presentation of new Colours. In presenting these colours to the Queensland University Regiment, may I respectfully adopt those words. His Excellency addresses the parade after presenting the New Colours. The reply to the address given by the Governor General Sir Zelman Cowan, presented by LTCOL Merv Littmann. 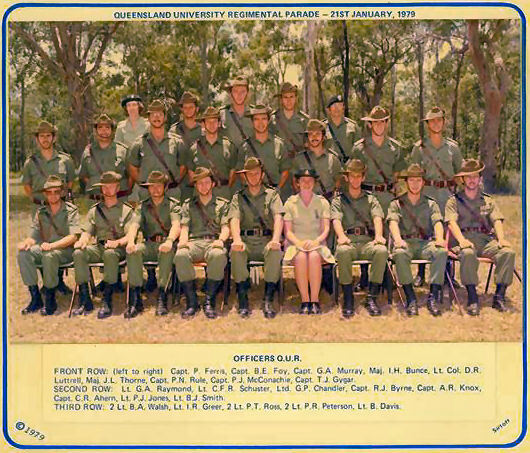 We, the men and women of the Queensland University Regiment, are honoured today by your presence and participation in what is for us, an occasion of significance and history. You have honoured us in the past, with your interest. That association with us today matures and becomes forever inscribed in out history. 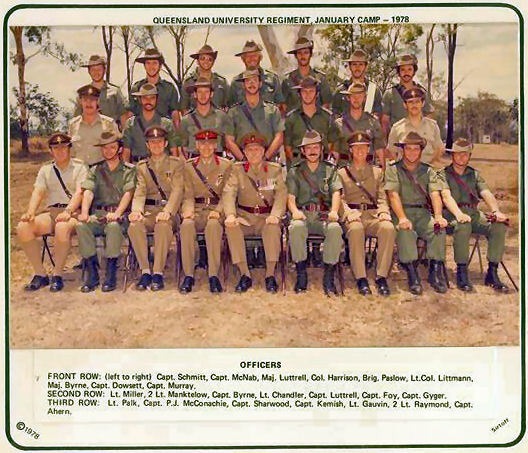 As Your Excellency has indicated, the Queensland University Regiment has varied in numbers in recent years. Yet there has been, and is a regimental spirit, steady and strong, in former, as well as present members, which has sustained us on more than one occasion, in times of need. The Colours we received today, are received with pride; with pride they will be bourne. In the words of Her Majesty to which you referred, we will always strive to honour them through our conduct and example, and to pass them on, un- tarnished, to our successors. The Commanding Officer LTCOL M. Littmann leads the Regiment in a service of dedication in which all the members reaffirm their allegiance to their Queen and Country. Major Dennis Luttrell (Left) and Major John Byrne (Right). Number 3 guard in the background. A letter from General Sir Arthur MacDonald KBE ,CB following the Colours Parade to the Honorary Colonel, Brigadier Tom Parslow. “I thought the presentation of the Colours yesterday was extremely well done under difficult circumstances. It is always a rather complex ceremonial and that, added to the fact that it was done on a grass surface – and a wet one by the end of the parade – must have made it more difficult than ever. Inside Emmanuel Chapel for the laying up of the old Colours. The colour party (Left to Right) LT Harry Gauvin, 2LT Graham Raymond. 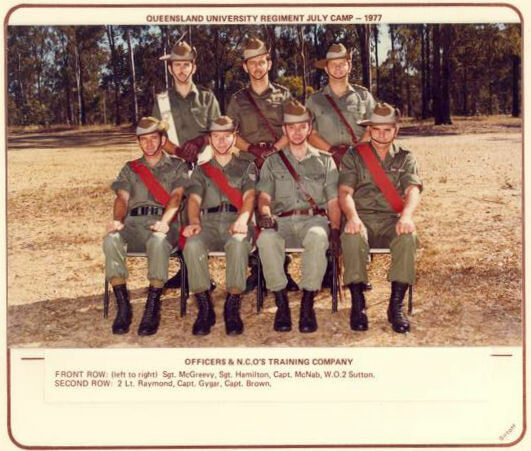 Seated in the foreground are Brigadier Tom Parslow (Honorary Colonel) and LTCOL Harry Standfast previous CO of the unit. On other side is the CO LTCOL Merv Littmann and behind him Brigadier John Springhall. When it was decided that these needed to be removed and approval was received from the University, a crane was produced from 2 Div Engr Spt Sqn to lift them out, concrete and all and placed near and to the river side of the grandstand. This became a simple job easily executed. Their replacement however created a few extra problems. The day arrived for the task arrived, so did the crane but the oval was too wet to do the job. Four days later, Lt Peter Jones (Chemical Engineer Extraordinaire), a small work party, some rope, star pickets, a mini mix concrete truck, a level and a keen eye had the posts replaced. For the two Sunday mornings prior to camp, officers to be on the parade attended some sword drill at the Depot to remove the cob-webs. The afternoons were spent with paint brushes, etc, at the ready, finishing the improvements to the mess. There were a number of things needed to assist in the parade which the unit could not obtain from other sources. The talents of a number of people were exercised. Barrier posts, traffic and information signs were produced and painted by LT Peter Morton in his anxious moments awaiting the birth of his first daughter. Rope for the barrier posts was acquired by WO2 Spike Jones and dyed blue to match the dais canopy by his storeman LCPL Bob Kyte. Mrs Coleman, the RSM’s wife sewed up small flags for the parade ground markers while a group of soldiers were armed with paint brushes virtually with the order “if it doesn’t move, paint it white”. In this way the dais, the unit flag pole were each included in the face lift. A teaset from the Parliament House dining room was borrowed for the afternoon tea to the official guests. A truck load of green plants were made available by the City Council to decorate the Depot Hall. The transport officer had great difficulty obtaining enough stars for the star plates for all the official vehicles for the Colours Parade. 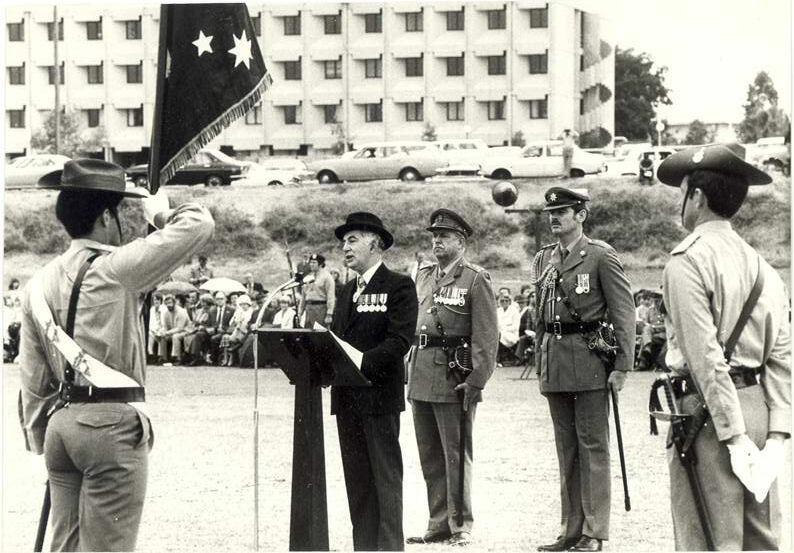 The new Regimental Colour at the 1978 Colours parade was carried by Lieutenant Chris Manktelow. Lieutenant Peter Jones carried the Queens Colour. 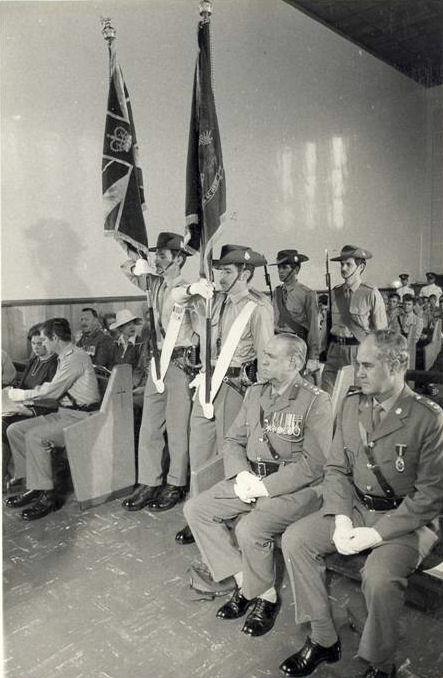 The door attendants at the 1978 Colours parade were Sgt Costello, Sgt Miles, LCpl Jones, Pte Kilworth. Chaplain General Hulme- Moir consecrated the new Colours . 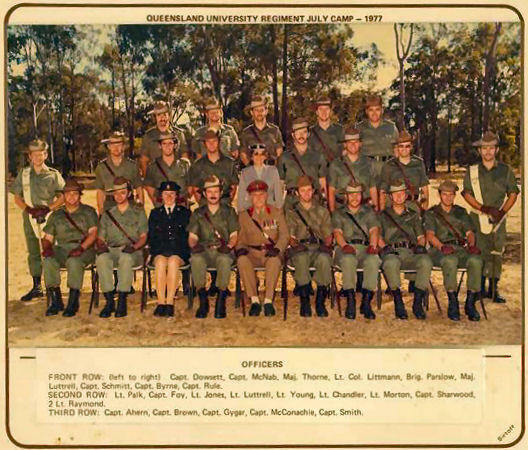 The old Queens and Regimental Colours were laid up at Emanuel College Chapel, St Lucia on the last Sunday of the July Annual Camp in 1978. The lessons read were by the CO and LCPL MacCallum ( a theological student in the unit). A Regimental Ball was held on 18 July 1978 at the University Refectory. It was an excellent evening, brilliant band and good food. QUR Order of the Day 12 July 1978 Issue Number 13 RO Number 43. 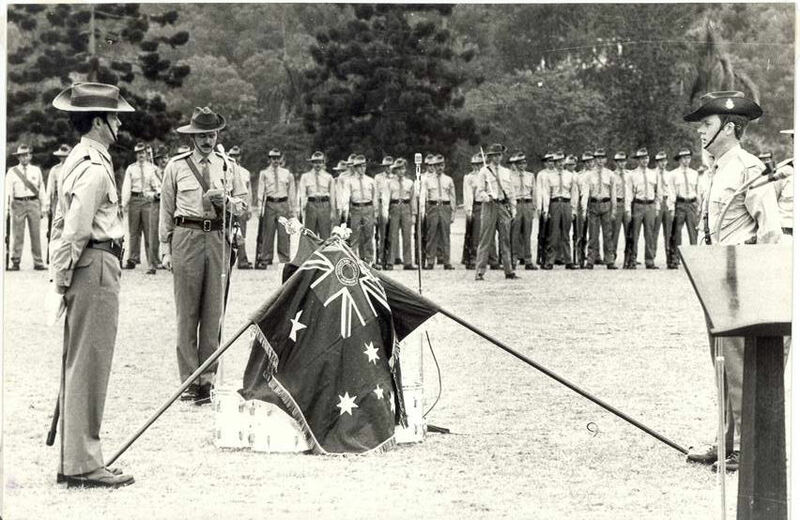 All members of QUR are to be congratulated on their standard of drill on the presentation of the Colours Parade, on 9 Jul 1978. The Regiment can be proud of its achievement. The parade was, by all accounts, a moving and spectacular ceremony and I have received nothing but congratulatory comments from all visitors, including Senior Service Officers. By your efforts, you have made this historical Parade a day that will be remembered with pride, by us all. Did you see that Tony English got an AM(civil) in the Queen's Birthday Honours? See Courier Mail of 12 June, page 23. 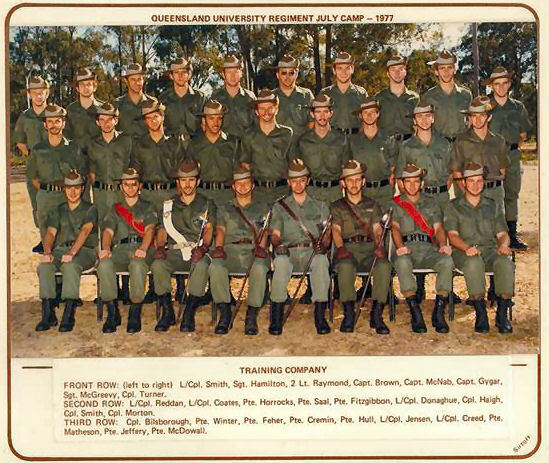 He joined QUR in 1962, graduated to RAA and retired from the ARES as a Colonel (I think). Yes you most certainly can make mention of the donation in the Newsletter in whatever way you deem appropriate. I hope Trevor Luttrell received the short note of thanks I mailed last week, in it I endeavoured to make mention of the emotional impact the donation and his letter made. Peter, it is strangely wonderful when you are unexpectedly down on your luck through an act of God, to be the recipient of such unexpected unmitigated generosity. Descartes once opined that it is only through malaise that we know how good it feels to be well. Such an epiphany we have experienced emotionally thanks to QURA and other good folk who have rallied to our defence. That letter and its contents provoked an intense feeling of gratitude and humility, mixed with embarrassment and love of your fellow man, if that makes any sense. You see diasters of whatever nature, bring out the best and the worst in humankind and I think the entire population who've survived this tragedy have seen both sides. 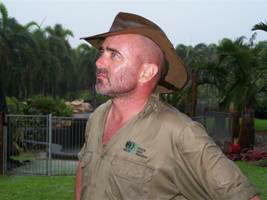 We certainly have; the light and the dark, the good and the bad and the ugly (that's me in the attached pic!). Such sights, sounds and actions we cannot and indeed should never forget. Now at last, with the weather turning fine and with some four months of hard labour behind us, we can plainly see our efforts and the progress we have made. There are still many months of hard work ahead of us but I believe we have crossed that psychological divide and can now look forward to forging ahead and getting on with life. Thanks to the support of our dear friends we will win through and carry on. PS I attached a couple of pics. One: of me the day after the Cyclone, you can see our Foxtail Palms in the background still appear green and not too badly affected by the big blow. And the second: our Foxtail Palms now after four months, most have unfortunately succumbed to the ravages of that fateful day in March. Such is life. I tell you Peter one day in the not too distant future when this bloody Cyclone is but a fading memory, I shall make it down to one of the Regi dos and it shall be my honour to buy the first round...or three. Just had a few moments to read the newsletter - click here it said! Took ages and I enjoyed reading all the bits and pieces. Might add a couple of anecdotes in due course - ie, after the persons concerned have attended their last and final parade!! Saw the photo of Brian Smith which is most topical - being an old Foreign Legionnaire, he has been a tower of strength in helping us Nashos (Aged, that is!) from the Redlands Branch in organising a trip to Noumea to march in their Bastille Day celebrations. Should be a great occasion, and we look like scoring an invitation to the official reception afterwards. Will be 14 of us in the march, cheered on by our respective tax deductibles. All this really came to fruition when, during the last Back to the Regiment evening ,when after a quantity of tubes, we got to talking about some difficulties and delays we were experiencing (not on their side either!) and these were swept away by some quick and decisive communications. Great stuff! Just as well I served with him! Might send you some pikkies in due course. Do you have any old photos from QUR? If so, please forward to Trevor Luttrell so they can be scanned for inclusion in our compilation of QUR's History. The outcome of a battle depends not on numbers, but upon the united hearts of those who fight. It is fighting against a great disadvantage to fight against those who have nothing to lose. Speak to me of a general who has made no mistakes in war, and you speak of one who has seldom made war. No man can fight unless he is properly fed on beer and beef. There is no weapon too short for a brave man. What I want to avoid is that my supplies should command me. War is made possible by biscuits. I detest war. It ruins armies. A general should be capable of making all the resources of the invaded country contribute to the success of his enterprise. of the use of combats for the object of war. You will usually find that the enemy has three courses open to him, and of those he will adopt the fourth. The god of victory is said to be one handed, but peace gives victory to both sides. I would define true courage to be a perfect sensibility of the measure of danger, and a mental willingness to incur it. As long as war is regarded as wicked it will always have a fascination. When it is looked upon as vulgar, it will cease to be popular. The number of medals on an officer’s breast is in inverse proportion to the square of the distance of his duties from the front line. The nation which forgets its defenders will itself be forgotten. Patriots always talk about dying for their country, and never about killing for their country. It’s not the world that‘s got so much worse, but the news coverage that’s got so much better. A single death is a tragedy. A million deaths are a statistic. In no other profession are the penalties for employing untrained personnel so appalling and so irrevocable as in the military. “Yes Sir”, “No Sir”, and “Sorry Sir”. Repeated in the proper sequence, they will get him through the most difficult interview with the minimum discomfort. Kill one man and you are a murderer. Kill millions and you are a conqueror. Kill everybody and you are God. The only thing harder than getting a new idea into the military mind is to get an old one out. Guerillas never win wars but their adversaries often lose them. Look at an infantryman’s eyes and you can tell how much war he has seen. The atomic age is here to stay – but are we? If I had only known I would have become a watchmaker. We have the power to knock any society out of the 20th century. with any contact details that you have.